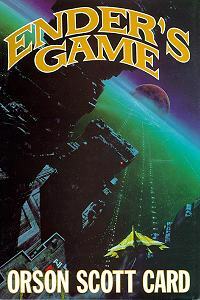 In celebration of the release of Ender in Exile, I decided to reread Ender's Game. Though I admit it doesn't take much for me to find a good reason to revisit an old friend like Ender. There are times I wonder why I keep going back again and again and again. What is it about Ender and his friends that I just can't get enough of? I don't have the answer to that. But I do know that each time with Ender is just as magical as the previous times. I never get tired of reading Ender's Game no matter how many times I reread it. And there aren't that many books I can say that about. First sentence: "I've watched through his eyes, I've listened through his ears, and I tell you he's the one. Or at least as close as we're going to get." Ender's Game is a story about children who don't act like children. Set several hundred years in the future after the first and second wars with the Buggers (or formics), the military-powers-that-be take the most promising children and send them into space to attend Battle School. There they are raised to be soldiers and officers and commanders. No kindness or compassion allowed. Our hero, Andrew Wiggin, is just six when he's taken to Battle School. His nickname is Ender, and he's one-of-a-kind almost from the very beginning. He's the child that shows the most potential, the most promise. But to get him to commander-stage, he'll have to be treated harshly. Even more harshly than his fellow launchies. Do the end results justify the means? You'll have to read and see for yourself. For my more extensive review of Ender's Game, see this review. My son had to read this in high school and I've been wondering about it ever since. Thanks for prodding me to get a hold of a copy. I loved this book. Even though the way Ender is treated is very disturbing, the story still touched me. I have a couple more in the series on my shelf to read someday. Oh I loved this book, which really surprised me - my husband got me to read it while we were dating in high school. What a great book! I saw your link on Semicolon's Saturday Review!